We've already covered out of the box ways to have better lead conversions and today I'd like to add more to that because in this industry we must always have to be creative and innovative in thinking of new ways to close more deals. We have the pleasure of speaking with real estate agents on a daily basis and solving their pain-points by adding features to our ever-growing platform, Duvora. Using our platform, you can pinpoint off-market pocket listings that fit your client's exact needs rather than spending a lot of time searching on social media, on other pocket listing sites. Searching one by one for your buyer needs on social media , on pocket listing, on different real estate platforms is ridiculously time consuming. Having no process and no systematic narrowing down of these information can be a bit overwhelming too. 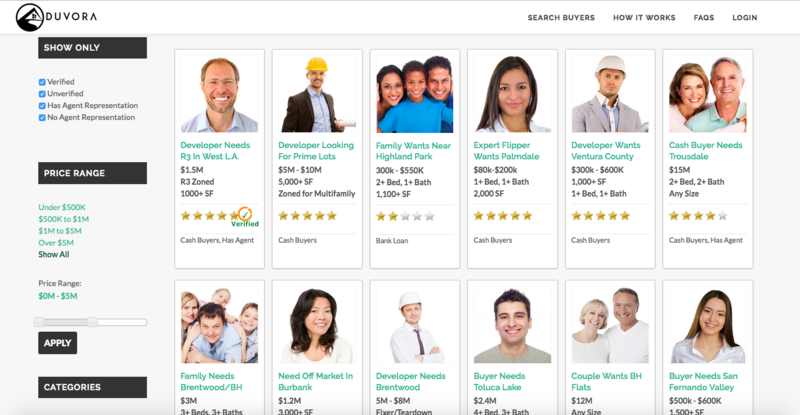 In Duvora, you only need to click on the Buyer Needs button and you can easily search or enter your client's search criteria to have off-market listings matched instantly to your client's needs all in this one website. 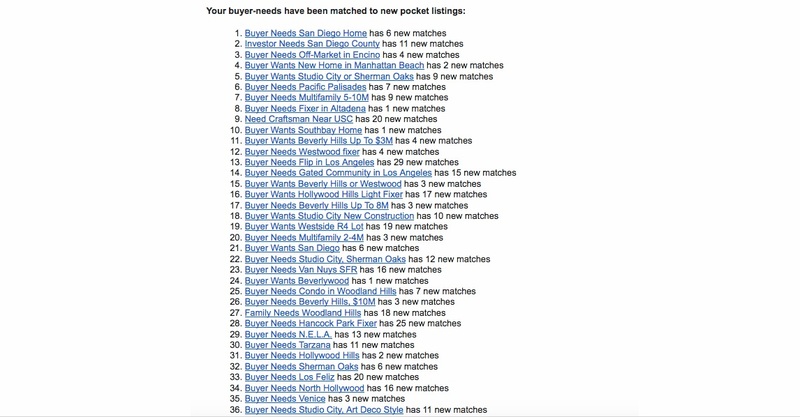 For example, an agent uploaded several buyer needs and by clicking them, it will show you all the matching properties for that particular buyer need. What that means is that all of our database has been queried and has matched off-market listings to a particular buyer need. You don't have to go out and search to different social media sites like Facebook, Instagram and try to dig through posts and look for exact properties that will fit your buyer. You can take a look at the photo below for a quick peek of what's inside Duvora. As an extension to the first feature, you will also have a feature wherein not only are we matching off market pocket listings presented by other agents to your buyer needs but also matching homeowners in the Homeowner's Tab. If you contact homeowners with details about what your buyer is looking to purchase, you could start the conversation with a homeowner about their willingness to take offers, their willingness to think about selling, or would they let your buyer preview it if they think about selling and this starts the whole process of closing a deal. Also, if you know it's not a good fit for your buyer at least you already built that rapport and conversation with the homeowner and maybe down the road you can talk about listing. If you want to talk to any of these people you can just simply click the listing, it also gives you a map where you can get a nice view of the location and of the property. You can see it from the top, from the side, from the satellite view. The most powerful part here is the show contact info. Through this you'll see who the owner is , their phone number and their email as well. It's easier for you to reach out to particular homeowners with your buyer needs and say "Look, I have a family of three that needs a well-maintained home and a prime Encino or surrounding areas from nine hundred thousand to three million and they would be very happy to look at your property if you would ever consider selling." Now on the flip side of that when you do submit a pocket listing to us, you will get an email approximately about 15 minutes afterwards and in that email you will have buyer needs which match your pocket listing. Now on the reverse side of this so if you upload an off-market listing to us, you will get buyer needs that match that your particular listing as well as each agents contact information. Our platform offers easy to navigate interface with information displayed in kind of like a marketplace format - much like Amazon. Our platform and those three powerful ways that you can use in our system help you close deals especially where off market pocket listings are so high in demand. We spare you the long hours in doing all the searching as we do it all for you. Please check it out and sign up for an account with us. It's Free! So if you guys have any questions like always please contact me at support@duvora.com. I will see you guys at tomorrow's blog. Have a powerful day!